Take a good look at the credit union movement, from the outside or within, and what you’ll see at its foundation is People Helping People. 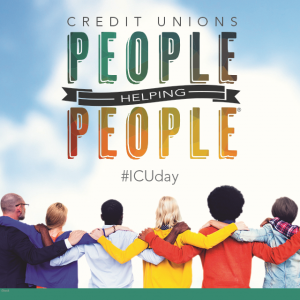 On October 15th, credit unions worldwide will join in celebrating the year-round impact of the credit union movement and its members for International Credit Union (ICU) Day. We continually demonstrate our ability to improve the lives of individuals, families, and the communities we serve, and have done so for generations. Doing good is something credit unions take seriously, locally and globally. This cooperative spirit of people helping people has led to life-changing opportunities in the form of small business start-ups, home ownership and education. The cooperative spirit is alive and well at HUECU and we look forward to making a positive difference in our members’ lives for many years to come. As we celebrate International Credit Union Day on October 15th, we celebrate the theme of “People Helping People” with more than 200 million people worldwide to establish credit unions as Americans’ best financial partner.